The Guardian: Nothing less than a renaissance of the German film industry is expected of Run Lola Run, by the young director Tom Tykwer, whose outstanding debut feature, Wintersleepers, was an international hit. 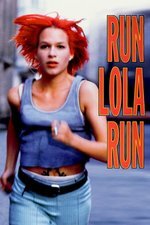 This movie is effectively three variations on a theme: that theme being Lola (Franka Potente), a flame-haired punkette running like mad through the streets of Berlin. NYTimes: Mr. Tykwer does this with a vigor and pizazz that offset the essentially empty nature of the exercise. And he makes ''Run Lola Run'' sufficiently hot, fast and post-human to pull that off. For its sheer cleverness and gamesmanship, its altered sense of emotion and meaning in the face of breathless forward momentum, his film makes a startling harbinger of things to come. Mr. Tykwer deliberately blows away all traces of the mundane and the familiar, so that not even the closing credit crawl moves in the expected way. Roger Ebert: "Run Lola Run" is essentially a film about itself, a closed loop of style. Movies about characters on the run usually involve a linear story ("The Fugitive" comes to mind), but this one is basically about running--and about the way that movie action sequences have a life and logic of their own. I would not want to see a sequel to the film, and at 81 minutes it isn't a second too short, but what it does, it does cheerfully, with great energy, and very well. I love love love this film, as well as Der Krieger und die Kaiserin, but I have been underwhelmed with his career since. Saw this in the theater when it came out and loved it. It's definitely one of those that I'm a little scared to see again since I'm not sure if it just worked in the moment or it'll hold up to a repeat viewing. I saw it a couple times - made the girlfriend watch with me after a film savvy friend sat me down with it. Loved it both times. No, uh, other big observations really, apart from that I haven't really seen anything that reminded me of it since. I think I've seen it at least four times and I don't recall that my enjoyment greatly diminished. There were various things that I noticed on the later viewings -- not just with regard to the whole gimmick, but also nuances of the performances and direction and such. Interesting to see it was directed byTom Tykwer, who also directed Cloud Atlas, another favourite riddle movie of mine. I last watched it soon after it was release, and have a copy floating around somewhere. I remember just enough of it to make a rewatch after this time... interesting. I watched it some months ago and it still holds up great. Stylewise it's a bit a product of the era, but it is brilliantly so. It is also an example how a movie can have a strong, yet simple narrative concept without having to drag for two and an half hours. I saw it in the theater and loved it, but when I saw it again six months or so ago it was good but not such a standout. I love how kinetic the movie is, one of the best I have ever seen for that. Hear, hear. Two excellent films. Love this, love the soundtrack and am please that both still stand up well after all these years. What I love about it so much is that gloriously is a movie, meaning it uses various tools to create a simulated reality that becomes something you wish was real. Just a joyously stunning achievement. I love this movie. It's been a good five years or so since the last time I watched it, but the whole thing is baked into my head by now anyway. Lola's doofy boyfriend, the weird hints that the security guard who has the heart attack is Lola's biological dad, etc., etc. I'm not a gambling man in the least, but whenever I'm in a casino I have to sit at the roulette wheel for at least a couple of spins and put a chip on 20. Best video game movie ever made. Not that it's about a video game, but that it IS a video game. Well apart from Edge of Tomorrow. For those of you who don't have kids, Phineas and Ferb's Run Candace Run bit is pretty gloriously evocative. This movie is still on my list of favorite movies. I listen to the soundtrack often. I still wish I could color my hair Lola red, but my boss wouldn't look too kindly on it. I went to this movie on a first date with a guy who turned to me at the end and said, "What's in the bag?" He wasn't joking and that was also our last date. That was not the only reason but, it certainly was a reason. Oh, I know this one. It's Marcellus Wallace's soul, right? Such a great movie. And maybe under-heralded as a feminist movie? Only 67 percent of the time. Such a perfect movie. I remember everything about it, despite not having seen it in ten years. It makes me sad to learn that the director went on to make Cloud Atlas, which is an irredeemable pile of garbage (though, given the source material, how could it not be?). i have watched this movie over 100 times easy. for a long time it was my anxiety calm down movie. i love it so much. Wow. That's impressive. I'm not even sure I've seen any movie more than ten times, though maybe a few of those they used to show once a year on TV. I've probably seen a fair number of movies between 5-10 -- I bet on multiple viewings, I peak at "5". But I doubt I've ever seen anything at all more than 20 times. So a hundred kind of blows my mind. Of course, almost half my life and all of my childhood predates even VHS movies, so that kind of viewing has really been available to me only since about my very late twenties. growing up we had a rack of orange label vhs tapes that would hold a couple movies and we'd watch them over and over and over again. my brothers and i would get into a mood and then it was something like rocky 1-4 on a continuous loop for a couple months straight, then we'd move on to something else, repeat. so there's a bunch of movies i've seen a really egregious number of times. when i moved out i continued this tradition with the blockbuster sidewalk sales when things felt fucked up, and things pretty much felt fucked up from 17-24. i was also an insomniac so watching movies i'd seen a bunch was like wrapping up in a big warm quilt.